Having Loved And Lost, One Man Takes On Medical Malpractice In India : Goats and Soda It's a country whose people are reluctant to report malpractice. But when a doctor prescribed "an astronomical dose of the wrong steroid" to his wife, Kunal Saha was determined to blow the whistle. 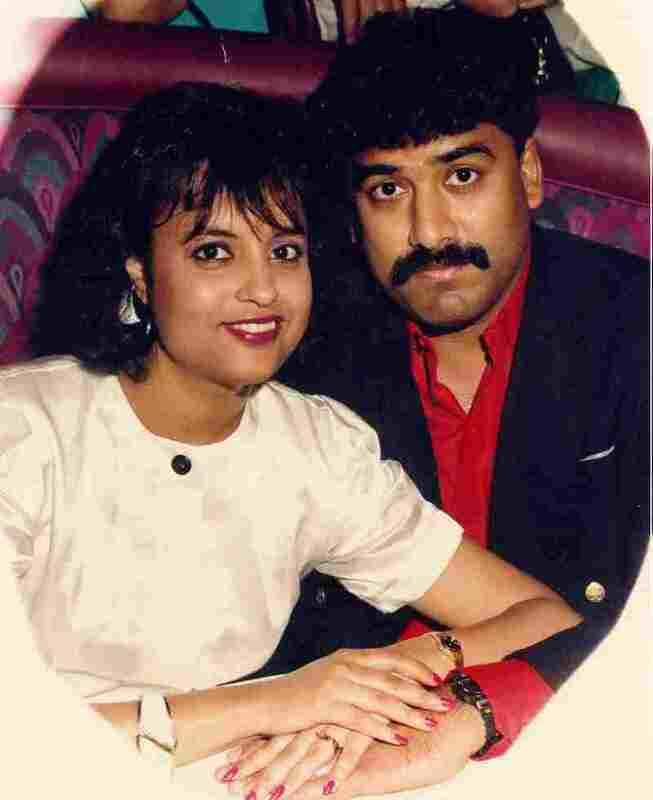 Dr. Kunal Saha (far right) and Anuradha were married in Calcutta, India in 1985. She died 11 years later after being prescribed a dangerous dose of a steroid. People sometimes ask Dr. Kunal Saha if he is married. His wife, Anuradha, died on May 28, 1998, and he has not taken a new wife. But Anuradha is still so wedded to Saha's thoughts, his heart and his life's mission that he feels no hesitation answering "yes." To hear him tell it, everything about their love was predestined. One day in 1985, he missed a train from Calcutta to Delhi. So he went to a picnic to cheer himself up. And there he met his future wife. He notes a coincidence that Anuradha pointed out soon after they met: her nickname, Anu, is spelled out in reverse in his first name, Kunal. "I am right at your center," she told him. She remains at his center. Her death due to a doctor's mistake set him on a new path, working to combat medical malpractice in his native India, where he founded the organization People for Better Treatment to expose and stop the ignorance, corruption and fear that lead to pervasive medical malpractice. Although his full-time job is as an HIV/AIDS researcher at Ohio State University, since his wife's death he has traveled dozens of times to India — five times in 2014 alone — to pursue his cause. Tragedy struck the couple 11 years after their marriage, when her studies in child psychology were complete and his training as a physician would land him a research position in Columbus, Ohio. Before beginning a new phase of their lives which they hoped would include having children, the two decided to take a trip to see her family in Calcutta. "We were ready to start a family," he says. "She wanted to visit Calcutta to get the blessings of her parents." They often returned to India for family visits. And usually, possibly because of pollution, they got a little sick. This time, Anuradha developed a fever and a rash that persisted. She was treated by a doctor who had a god-like reputation in Calcutta. But he made a terrible mistake. "He gave her an astronomical dose of the wrong steroid," says Saha. Dr. Sukumar Mukherjee treated Anuradha with a long-acting steroid, Depo Medrol, with twice-daily doses instead of the recommended one dose every 2 weeks. "I know what I'm doing," he told Saha. "I've seen this drug work like magic." Instead, it killed her. "Her immune system was destroyed," says Saha. The medical cause was sepsis, but, he says, "she died of a deadly combination of ignorance and arrogance." Since the death of Saha's wife in 1998, he's devoted his life to holding doctors accountable for malpractice. This picture was taken in 1992. Other doctors cautioned him to forget it. "My doctor friends said don't do anything, there is no consequence for medical negligence," he says. But he didn't let it go. Still grieving deeply, he started People for Better Treatment in 2001. He filed a suit against Mukherjee and three other doctors involved in his wife's treatment and lost. Then he filed an appeal, and in 2009, after fighting for more than a decade, he was vindicated. A Supreme Court judgment found Mukherjee and the three others guilty of malpractice and revoked their medical licenses. Later, the courts awarded Saha the U.S. equivalent of about $2 million. Saha gave a sworn affidavit that the money would be used only for the promotion of better healthcare in India, a promise he kept, even though two years later, the out-of-pocket costs of his work in India would force him to file for bankruptcy. An article in the British Medical Journal last week addressed the issue of the difficulties of blowing the whistle on doctors in India who practice fraud, use shoddy research methods or harm patients through negligence or malpractice. The article referred to a medical culture where physicians are reluctant to speak out against other doctors due to fears that it could lead to harassment, career damage and disciplinary action against the doctor bringing the complaint. Dr. K. Srikar Reddy, a physician with the Indian Foreign Ministry who is now based in Geneva, Switzerland, also lost his wife in India due, he believes, to poor medical care. She died in 2003, as did their infant during the delivery of their first child. His case charging gross medical negligence is working its way through the courts in India, thanks in part to Saha's efforts. "[Dr. Saha] has brought transformation in India regarding medical negligence by creating awareness — and saving lives," Reddy said in an email. After years of delay, according to the BMJ, India's Whistle Blowers Protection Act of 2011 became law in 2014. The law offers protections against retaliation to anyone who discloses fraud, corruption or mismanagement in public office, including government hospitals and clinics — but it does not apply to individuals who raise concerns about healthcare workers in the private sector. No date has yet been set to begin its enforcement, so how it will work in practice is not known, Venkatesh Nayak, program coordinator at the Commonwealth Human Rights Initiative in Delhi told the BMJ. Nayak critiqued the legislation for the BMJ article and told the journal that the law lacks provisions requiring education of the public and counseling of whistleblowers. But even though the country has a long way to go, the attitude toward malpractice is slowly changing. To judge the progress being made, consider that there were no cases of malpractice in 1998, the year Anuradha died, that resulted in a physician losing his or her license. In January alone, eight physicians in India lost their medical license because of poor care. "Every day, I get 70, 80, 90 letters from India. Each one has a story," Saha says. "In India, corruption is everywhere. Medical corruption literally means life and death. There are a lot of good Indian doctors, but the rotten apples are still running the show. But a lot of people have seen hope. They are fighting back. The huge stone is starting to roll." Saha feels it is his fate to fight to hold physicians in India accountable for their errors and negligence. "I am a doctor, but I am also a victim. I was born in India, but I am an American," he says. "I am truly uniquely positioned for this," he says. "I believe Anuradha came to me for that reason. I will continue fighting so I can make it an honest and fair system."